I have been doing a lot of reading and thinking ahead of #oer17 but what I am reading MOST are books to my little kid each night and throughout the day. Because I am neurotic about raising a kid who loves to read more than I am neurotic about anything else in parenting, and because the technical teaching of reading in school is OK but it doesn’t give kids the confidence to read and does not nurture a love of reading. 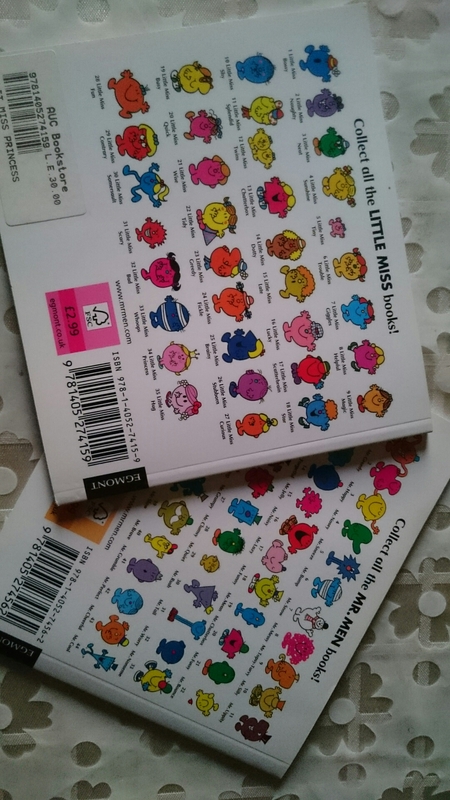 So she is currently addicted to the Mr. Men and Little Miss series. I have a lot of objections to the books, though. I don’t understand why the male characters are fully Mr but the female characters are Little Miss. Why little? I read about the original author (Roger Hargreaves) inventing the series to answer his (at the time young) son’s question “what does a Tickle look like?” and I love that the son in question, Adam, continued to add more books to the series after his father passed away. I often think a book has so much potential but ends up falling waaaay short of what it could have done (like Mr. Nobody – imagine how meaningful such a book could be! But it was rather silly in the end). And sometimes the storyline is downright annoying. And often the humor is really difficult for my child to understand… Though I get most of it, lilk the time Mr. Wrong said, “What? I was right? That’s so strange because I am usually…” [turn page over ] “…left!”. I do love how these books help my child learn the meanings of difficult words that are the descriptions of the characters (I don’t think even I knew exactly what Fickle meant before). I also think it’s interesting how they choose to illustrate each character to represent the adjective (or occasionally noun) that is their name. I sometimes joke with my kid and call her one of the characters when she does something. Occasionally I will make one up, like “oh, you’re Little Miss Thoughtful” (and of course I am then asked to explain what thoughtful means). So here is my caricature of Little Miss Open and it’s still in progress. How does Little Miss Open Look? Wide-eyed because she is open to looking at everything and curious? With perked up ears because she listens well? Open-minded – would we draw an opening in the head, or just never really close the head and have the mind popping out, or have a gear icon on her head symbolizing open process? Participatory – should her head be filled with thoughts/ideas of other people? Open arms? Open to collaboration with others? Overly transparent to the point that she makes herself too vulnerable sometimes? And then something interesting occurred to me. There is a book about Mr. Good who originally lives in Badland (poor fellow) where he is unappreciated (duh) but eventually stumbles upon Goodland… And I was wondering if maybe Little Miss Open is born Open but lives in Closed-Land then eventually moves to Open-Land. Then I realized I am pretty much describing myself here, right? Anyhoooo just needed to get this silly little brainstorm off my chest… If you’re interested in working with me on visualizing this, I may use it in part of my keynote 😉 I hope that’s not too silly.The rest of the keynote is kind of serious, I promise. But one of the beauties of being a parent is that in this horrible world, you get to be silly by duty for part of your day. And that’s a blessing. Very intriguing line of thought, Maha. I don’t draw, but your description was evocative of a young me. I came from a rural background so had none of the boundaries and self preservation that urban children learn to grow up with. Way too late in life I was still wandering around with head and heart and eyes and mouth open to the world. I am retired now and upon life reflection, I think these qualities brought me some pain but overall served me well. I’m still teaching one class a term and still trying new things, trying one last time before I go to get it right. Which is to say, how old is this character going to be? Cuz those qualities you outlined are not limited by age or gender or color. Clearly this is an opportunity for a fun Alien Open Educator! I look forward to what you and your collaborators come up with! Hehe i like your point about the ageless/genderlessness of the character. Though actually how the world responds to the open person.. Is contextual. Do some ppl not talk to me at all because i wear a headscarf? Do some ppl pay me extra attention BECAUSE I am in Egypt and therefore interesting just because of that? What risks do men vs women take by being open? The magic of the internet is who knew you wore a headscarf or why? I didn’t know you lived in Egypt and you may or may not know I live in Eugene, Oregon. Who can really tell my age? We choose how much vulnerability to express on the internet, we each define what “open” means to us and what our limits are.